So today we were out this afternoon for some fishing and sailing. The breeze was steady but not overwhelming or overwonderful either. 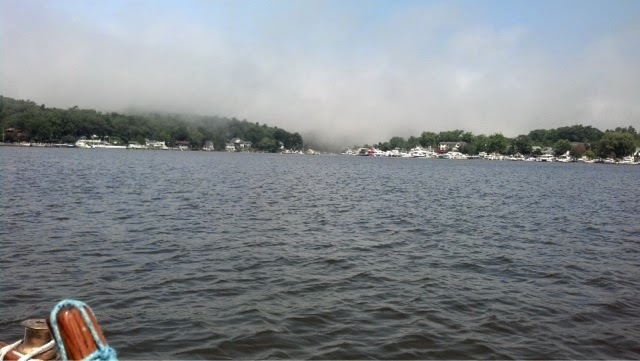 As we headed out of the dock the fog began to roll in off the big lake. A steady slow steam of white mist filled in the bay and over the next 2-3 hours it became so thick you could hardly see. We fished first today, anchoring out in the lake and casting a few billion times. Tangling up our lines and catching nothing. I hate fishing but kiddo likes it. While fishing it was nice to watch the local sailing club out racing. They have lasers, optis and 410s all out sailing together. 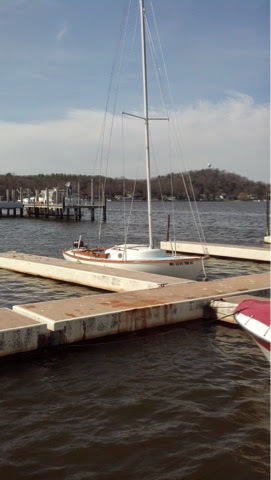 A Tarton anchored in the morning area and took some time to hoist his main and straighten out some rigging. Once fishing time was over, we sailed a little. I had high hopes of trying out my kite cam but forgot the string for the kite so that will have to wait until next time. Well the time of season has come. We are past the wind swept spring and moving into true summer sailing. This week I swapped out my main sail. I'm running all SailRite sails this week. These sails are the newest on my boat and look sharp and crisp as they fly in the air. The previous owner sewed up the main sail and I sewed up the jib. Together they look really sharp. 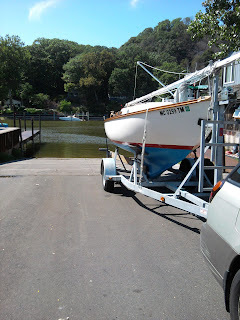 We sailed for about 4 hours this Thursday I had to drag Myles back in. He has this new thing he wants to sail at night. I think he just wants to stay up past bed time but I think I'll be humoring his request soon. Here we go Fourth of July and we are at Tower Marine again. Really you just can't find a better place to watch the fireworks. We have tried. We started off the evening with a little grilling. 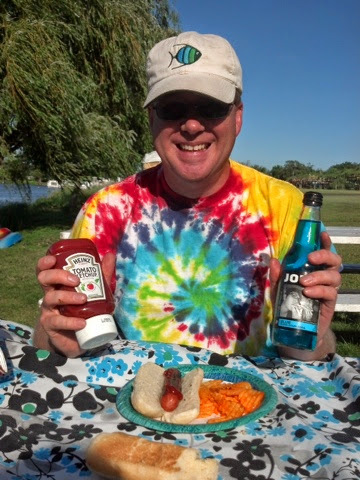 Hot dogs, chips ketchup and oh yeah Jones Blue Bubble gum soda that stuff is he best. 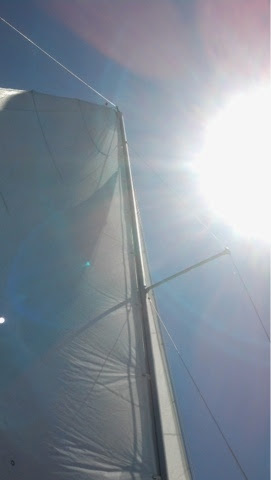 Next we sailed for a couple of hours out on Lake Kalamazoo. Looking around for the fire works barge. We never saw it until later that evening when it floated out to the middle of the lake. We followed this up with a trip to the play ground, We decided it was to cold to swim this evening so we went back to the boat to do some fishing. We are the worst fishermen ever. We never catch a thing. Next we fed the ducks. Then our friends started arriving. The fireworks where spectacular. Well, we swamped the dingy. Out on lake Hutchins we went for a little playing took a wave over the bow and she went down. Thanks to some friendly boaters we were quickly pulled back to shore. Unharmed and everything in the cooler stayed dry... "I knew I carried around an old hard shell cooler for a reason." 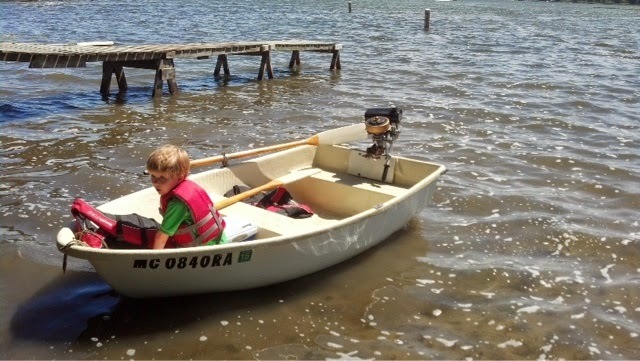 Now that there are three of us into boating it may be time to move up a size or two or look for an inflatable. For you true blue Cape Dory Typhooners note the motor on the back. Yes that is a British Seagull. 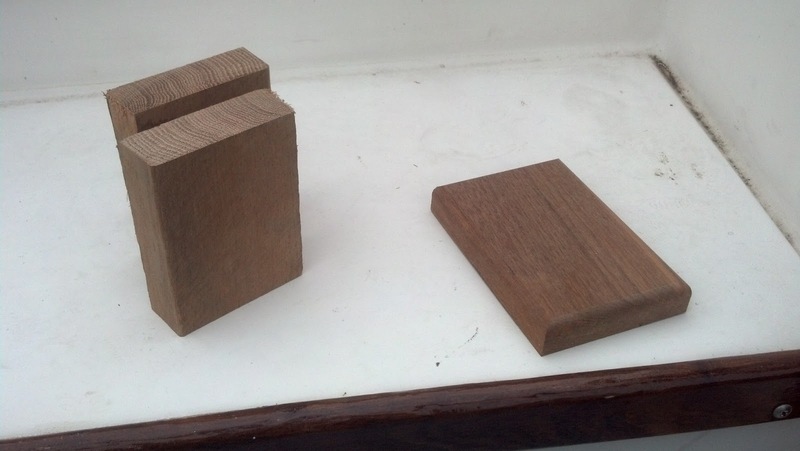 What your boat was likely equipped with from the factory. It's been at least two years since I've pulled the dink out and fired up the old Sea Gull. I restored this motor a few years back just for fun. After last weekend it looks like I may be back at it again. I'll have to get the water out of the gas tank to know for sure but as of yesterday the points are all dried out and I have good spark.